BOISE, Idaho, July 21, 2016 -- The Pioneer Fire has grown to 1,300 acres as warmer and drier conditions have increased fire activity throughout the day. High temperatures and changes in wind direction have compounded the situation, causing the fire to spot and spread to the north. With relative humidity less than 10 percent, the National Weather Service has issued a red flag warning. While temperatures will be decreasing overnight, a cold front from the east is forecasted for this evening, moving across the area with increasing winds. This front may intensify fire activity throughout the night. The fire is 20 percent contained and there continues to be almost 300 firefighters on scene fighting the fire, including five hotshot crews and five helicopters. Fire crews continue to hold the fire, keeping it west of Elk Creek. The fire is fully staffed and Rosenthal's Type 2 Incident Management Team has been briefed and will assume management of the fire on Friday. Smoke is very visible from all directions and reports from the public have been received from as far as Boise and McCall. An area closure has been issued and is still In effect. Currently, there are no structures in imminent danger. The cause of the fire is being investigated. 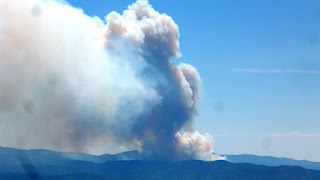 For more information about the Pioneer Fire go to http://inciweb.nwcg.gov/incident/4866/ or visit us on Facebook at U.S. Forest Service - Boise National Forest.